Let's address one of the main questions from 5x02. Who the heck is Jones working for, and when the heck are we? Fitting into that question is the flaming arrows brigade (who are either pure savage killers, or just don't like it when you steal their boar...). So who does Jones belong to? Well an initial reaction would be DHARMA, and indeed he is wearing similar style attire. However, he has no DHARMA insignia or admittedly any kind of 1970's hippy "save the world" demeanor. More like a "cut off a hand, ask questions later" mentality. Maybe he'll have a run-in with Pierre Chang one day. Or lest we forget, our screen-time undervalued friend Montand. So if Jones isn't DHARMA, who is he? He refers to the place as "our island". He has a British accent. He's actually wearing a mid-20th Century military uniform with nametag. 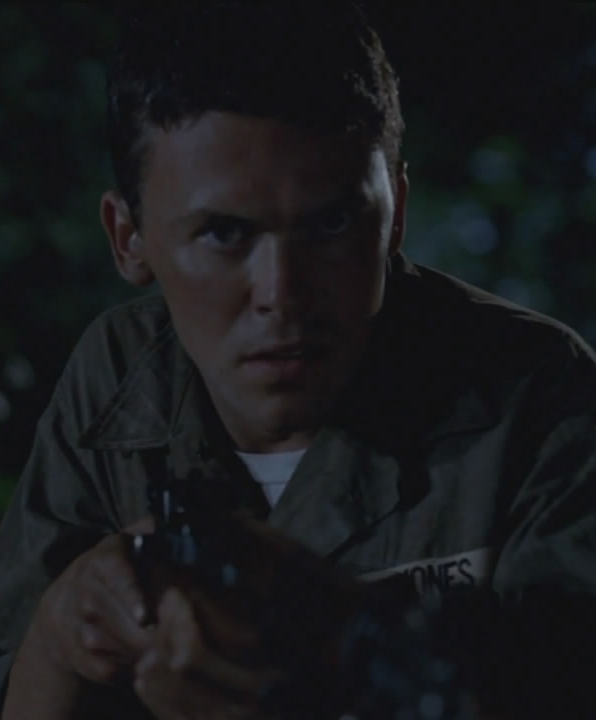 His gun is an M1 Garand (issued to US troops circa 1936-1963). The gun thing is slightly irrelevant though I'll wager - some of those guns the Others had belong in museums. What was striking for me though was the accent. Charles Widmore said to Ben that the Island was "his" - and so there could be an implication about 'what came before DHARMA' - who arrived in the 70's. Add to this idea those crazy flame arrow throwing mysteries, who could be the Others, but then again don't really seem to be following the same style. It all implies we're in a time older... and though not by much older - perhaps a time when the Widmore name DID have some kind of stake in the place? So, what do you think - is Jones DHARMA? Are we in a time older than DHARMA?